The day our first guests were due to depart, I saw no car when I went to feed the sheep, so went in through the main gate rather than the back one and noticed a pink envelope on the coffee table in the living room. 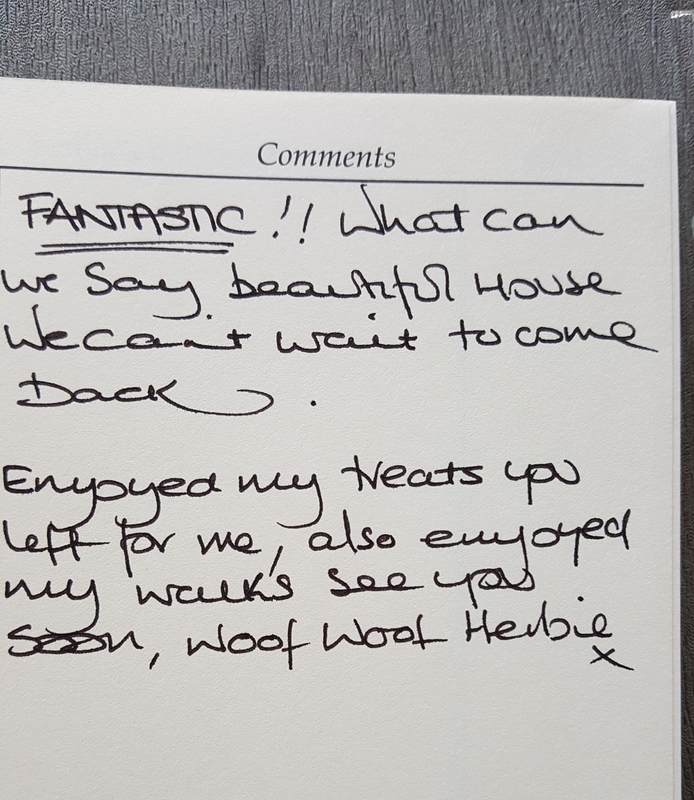 I went in and found that not only had they left the house practically cleaner than it was when they arrived, but they’d also left us a thank-you card and this very lovely message as the first entry in our visitor book. I really hope they’re all like this! I emailed them to say thank you and they gave me a couple of bits of useful feedback, firstly that there was a draft coming from the front door (which I have been trying to replicate and have concluded that I need to put something in the information book about lifting the handle up to engage the entire multi-point locking system when closing the door, because that’s the only way I can make it happen) and secondly that the shower screen leaked. 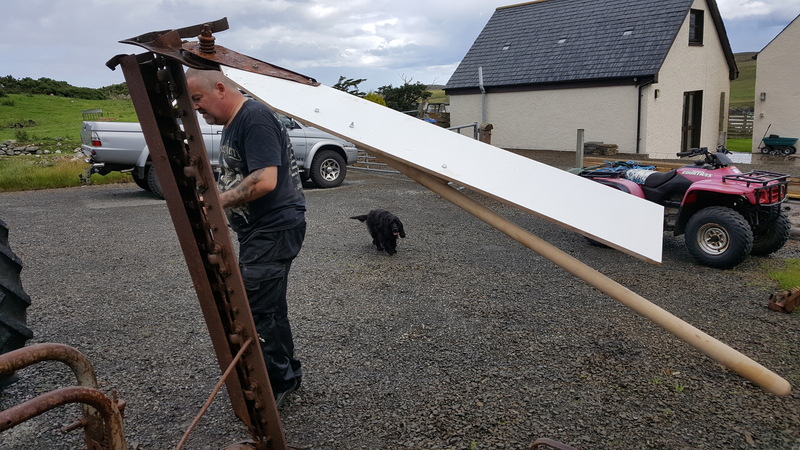 We have, I hope, got that fixed after Mick checked and then re-did the seals around it – it’s just finishing off 48 hours to dry out and then I’ll give it a test tomorrow. Today has been an exciting day as the valuer came round. 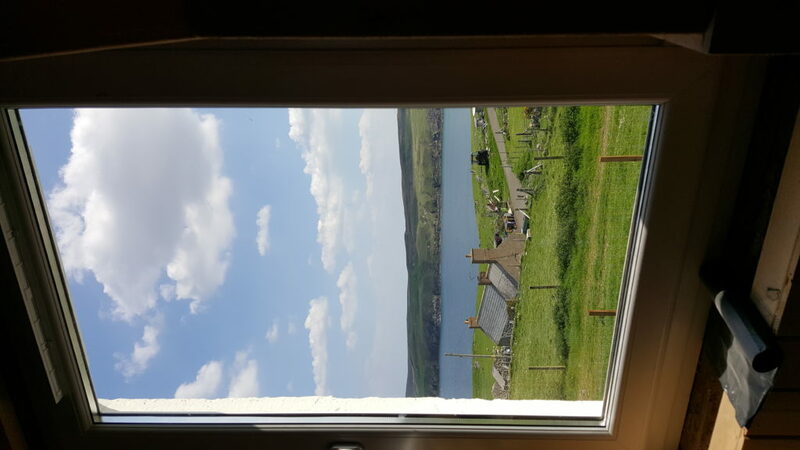 He couldn’t give me a number then and there, but he did say the stunning views and the fact that it’s essentially a new house inside a traditional shell (he said he doesn’t see many traditional croft houses in this kind of condition, which I hope was meant in a positive way!) would be reflected in the value, so I am hopeful that we’ll at least get to the figure I estimated on the Cumberland application and possibly even exceed it. The last two three bedroom houses sold in the village, which were both in good repair, went for £15,000 and £22,000 more than the number I came up with. He was carrying on west and going to value the house we’re buying straight afterwards, which was useful, because I was able to tell him what I’d estimated rental income at and he said that without even seeing the house, that sounded reasonable – although obviously again, he couldn’t guarantee that’s what would go in the valuation report without going round it. Anyway, he said he’d get his reports back to both banks by the end of the week and since these valuations are the last things I’m waiting on before full formal mortgage offers are issued, I think I’m going to spend the next few days biting my nails. The solicitors are primed and ready to go! I have spent the last four days phoning the branch and leaving my details with the promise of ‘someone will call you back’. They finally did today, in a most apologetic manner, but they’re currently down 2/5ths of their mortgage consultants due to holidays and illness, so they’re a bit stretched. 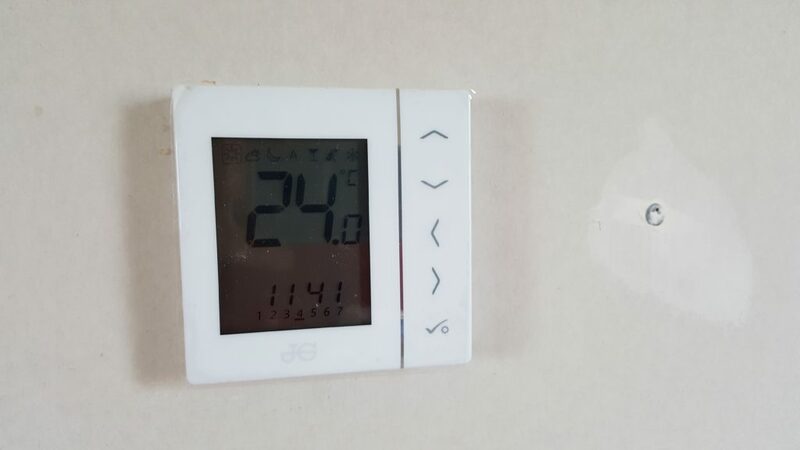 The upshot is that the underwriters have agreed a figure for my income to go into the affordability calculations, the mortgage consultant has re-run the affordability calculation and we still pass, so they are happy to offer us the residential mortgage subject to the house being valued by a surveyor from their panel. However, since my mortgage consultant is away and the deal is slightly complex thanks to the linked commercial mortgage, they’re going to double-check with the commercial side that they’re happy before getting in touch with the valuers and instructing them to make contact. Fortuitously, the sellers of the house we’re buying were around today and so I was able to go and break the good news in person. I now have a to-do list as long as both my arms, but it looks like we’re finally moving forwards again. Guess what? The income statement turned out NOT to be the final hurdle. They decided they wanted to see my 16/17 accounts as well, so my very patient accountant prepared them for me and I sent them off at the beginning of the week – after first checking that this time they’d be happy to have it as produced by my accountant’s software, because HMRC is stopping doing printed SA302s for mortgage applications as of 1st September and there’s a 2-week delay between your tax return being uploaded and them being able to send you one, so I’d fall outside the cut-off date. The building society passed it direct to the underwriters on Wednesday, who scheduled Saturday for a review of the whole application, but I was told I likely wouldn’t hear from them until Monday. So I’ve been a bit twitchy this weekend. The double bedroom has had its second undercoat and the ceiling has had two top coats. I’m currently about half way round the first base coat on the woodwork – I’m going to give it two coats of primer this time and hope that means I only need one coat of the final Milk Bottle. I also think I might have to re-paint the kitchen a different colour. It was originally intended to be something close to Farrow & Ball’s Cooking Apple Green, but when the paint in the Crown kitchen range I was looking at online turned out to be much, much lighter on the tester, I panicked and grabbed that Island Blue instead. 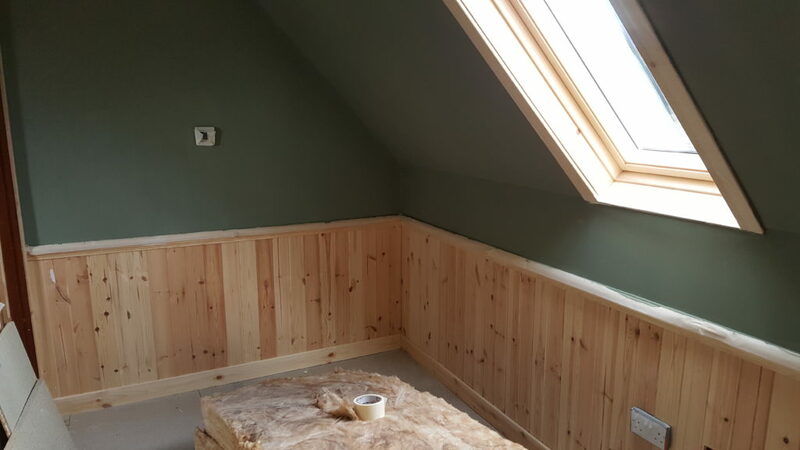 But I like the muted dark green so much upstairs that I’m considering trying to find something close to Cooking Apple which will stand up to kitchen wear and tear – or maybe even splashing out on a can of F&B Modern Emulsion. Today could be D-Day for the mortgage application. Looking back, I can’t see if I mentioned it on here or not, but a few weeks back I got a call from the lender (residential side) to say that they were no longer doing mortgages on properties outside their geographical area, but as we were so far through the process, if I paid the reservation fee we’d be allowed to continue. So I rang them up and paid the £199 and got on with chasing up my SA302s from HMRC and Mick’s employment reference, both of which were duly sent off. Then they rang to say that head office couldn’t work out whether my income was on track to be similar to previous years. Could my accountant please write a letter confirming that it would be, as they were a little concerned by the drop in income between the two years of self-assessment paperwork they’d asked for. Well, no, she couldn’t, because the sum total of involvement my accountant has with my business dealings is getting a multi-tab spreadsheet around the end of May listing out all the invoices I’ve issued and received for the various pies I have a thumb stuck in. In all honesty, I didn’t even put her in the position of having to say no – I did a year of KPMG’s graduate programme before deciding accountancy wasn’t for me, and I wouldn’t have done it, or if I had it would have been so heavily caveated as to be basically worthless. If you put 42 ewes to the tup in November, how many lambs and ewes do you sell the following year and what is your wool clip price? Assume 50% of ewes have twins, 50% of all lambs are male, 5% of lambs die between conception and sale, 5% of ewe lambs do not make the grade for retaining as breeding stock, you wish to retain a maximum of 30 ewe lambs, your 5-year-old ewes are drafted out and you get approximately 2.25kg of wool per sheep at £1 a kg. With all the number crunching it was a nice break to get down the road to do some painting. Some colour’s gone on the wall in the single bedroom and it’s turned out to be exactly the same shade as my father’s old study in the house I grew up in! In the meantime, we’re gearing back up for haymaking, although the weather isn’t currently giving me much cause to hope we’ll get it in. I might have to get someone in to do big round bales and wrap them for haylage instead, especially considering Mick’s having an issue with his hip and won’t be able to spend all day in a hay field carting small bales back up to the barn. 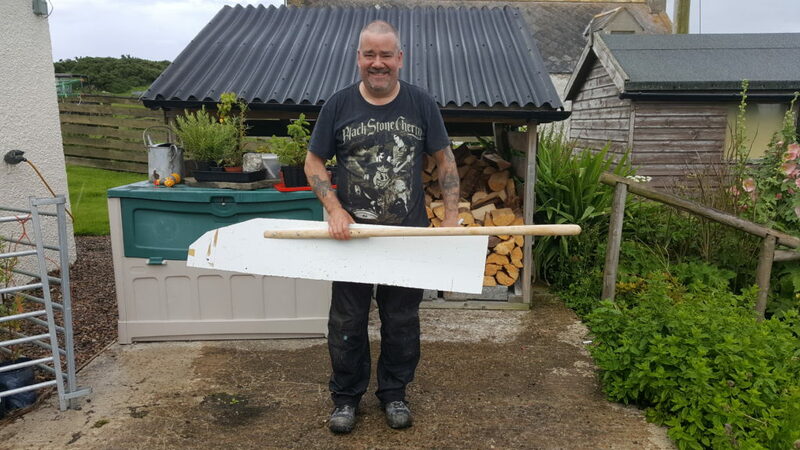 He has, however, made me an impressive new swath board for the mower. This pushes the cut grass over by about a foot so that the tractor has a line of bare field for its wheel, the stick on top knocks over any grass that’s thick enough to go over the top of the board. At the moment, the long-range forecast is showing a dry spell 18th-24th August, but it keeps coming and going, so please cross your fingers on the other hand for that! Interesting article from the FT about the Bank of England’s overhaul of mortgage affordability rules. Basically instead of stress-testing applications to 3% above bank rate, lenders must now stress-test applications to 3% above their reversion rate, i.e. their standard variable rate. For me that means my lender will now have to judge my application against a rate of 7.24% for the residential and 7.99% for the commercial. I’ve run the numbers myself this evening and we’re definitely okay on the commercial side. The residential – I don’t know. I think we’re okay; they told me when I first applied that they’d lend us something like £168,500 maximum (that was taking into account the 0% card payments), but we were capped to £135,000 because of loan-to-value, so I hope that’s enough wiggle room to deal with the extra. It occurred to me this week that I never rang back the holiday letting agency after they came for their visit last month, and as we get closer to decorating, I thought it might be a good idea to see if they had any tips for me, so I dropped them an email and the rep who’d come out to see me rang me back a couple of hours later to say how delighted she was to be taking on the houses and to have a chat. Basically there is no fixed checklist to getting a 4* rating (which is what I’m going for) and the house doesn’t have to be completely 4* throughout, a few 3* items, as long as they’re not major items, will not lower us a grade. Basically for a 3* think ‘Good’, for a 4* think ‘Very Good’. Tesco crockery is fine as long as it’s Tesco Finest not Tesco Value, as it were. It does mean I have to rethink my furnishing budget, as my plan of upcycling secondhand stuff is very likely not going to be acceptable. I’m going to need two leather sofas, a king-sized bed, three 3ft single beds, 3 chests of drawers, 5 bedside tables, 2 wardrobes and a kitchen table and chairs (already have an oak coffee table), along with all the other stuff you expect to find in a comfortable holiday cottage, like a decent television, soft Egyptian cotton bed linen, fluffy towels, pictures on the walls for rooms that don’t have a feature wall (apparently this gets you extra points towards 4*) and everything you might expect to find in your kitchen at home. 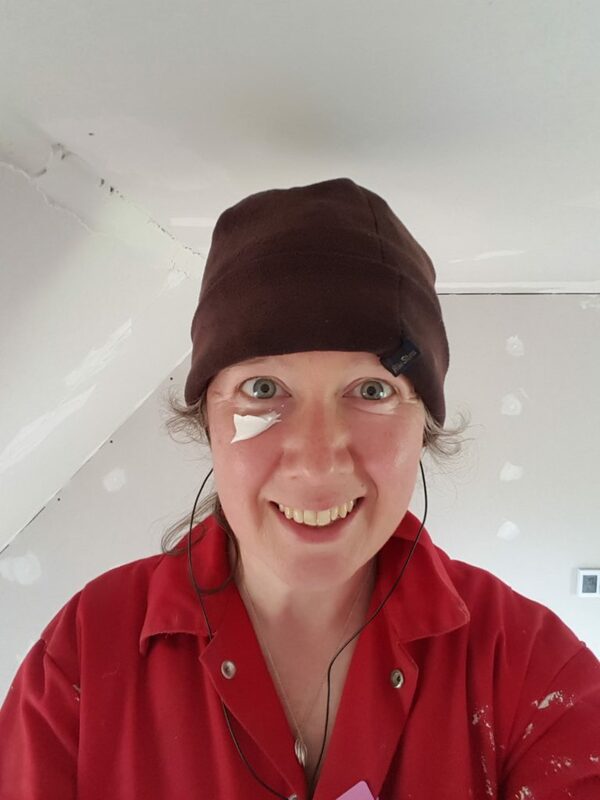 In the meantime, I am plastering on (I’ve nearly caught up with Mick now, just one more wall to go until I’m at a stop because he hasn’t finished the plasterboarding!) and after nearly three months of managing not to plaster my face, the final bedroom ceiling got me! The residential lender has been in touch to say the credit reports are back, but because I provided the version of an SA302 my accountant’s tax submission software spits out rather than a proper HMRC one, there’s a slight problem with verifying my income. I can either write to HMRC and request they produce official ones for me (I can’t just print them off the website because that option isn’t available when your self-assessment gets submitted via accountants’ software) or they can forward my application to their head office for one of the senior lending staff to look at it, and they recommend I take the latter option because “referral route may be quicker on the basis that my head office would be happy to agree” – which sounds promising! They also sent me a list of valuers on their panel to choose from, so fingers crossed we’re nearly there with this. SGRPID got in touch to say that the Drawings Office would be visiting on 26th June to survey the house site and garden at Ethel’s in order to prepare the sale plans. This is amazing news because originally I was told it would be about six months, i.e. October/November. It may actually now turn out that that side of it is ready before I’ve finished the house. Anyway, all good incentives to carve out some time to get my overalls back on, and the upside of working flat out on something for the past week (to the extent of starting at 6.15am and closing the laptop at nearly midnight for the last two days) is that the invoice covers a very large chunk of what I need to make from the day job each month, so I don’t need to go chasing around for other work too hard for the next three weeks. Good news! After a lengthy conversation with the residential arm of the company doing the commercial mortgage, we have a conditional agreement to lend us £135,000 to buy the new house. I have to send them Mick’s payslips, my tax returns and 3 months of statements for all our current accounts, and they want a valuation done because the seller’s surveyor isn’t on their panel, but if we get through that, we’re in the clear. Even better, their 5-year fix rate dropped by 0.1% last week. With that back on track, I’ve turned my attention back to the plastering, which it seems I’ve now been doing for 2 months. Lesson learned – next time we get one we have to go back to bare walls with, I’m taking £500 out of the budget for lost earnings and blitzing it full-time for 2 or 3 weeks. I’m working in the north bedroom at the moment and that gable end that gave us problems with leaking is all sealed up. Pretty hot working up there on Friday morning though! And this is definitely a room with a view (pic may be temporarily sideways, but I’m in Glasgow writing this on my phone and can’t fix it until I get home!) EDIT: Home and it’s showing as the right way up in the source, but not in the post – weird! 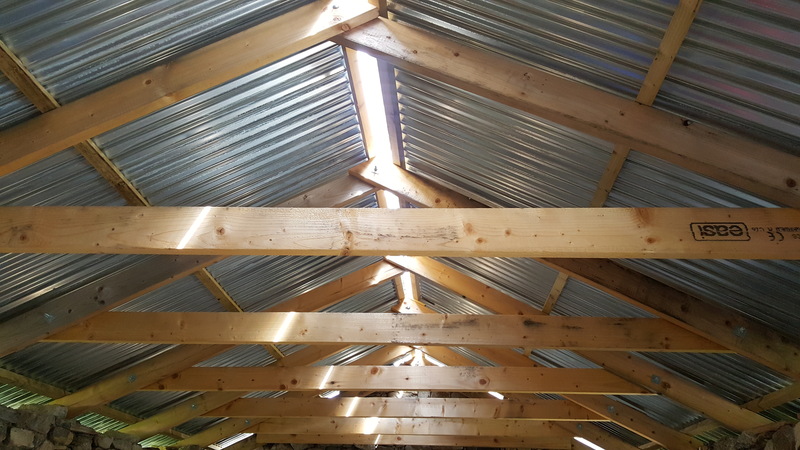 Pete and James have been back to start putting the tin on the barn roof and it’s looking great. We’ve been on a bit of a hiatus with Ethel’s as my time has mostly been taken up dealing with mortgage companies. We’ve hit a snag – our current residential lender has decided it won’t port the mortgage after all. Truth be told, I’m not terribly surprised. They’ve been closed for new business for years, have a dwindling number of mortgages on their book, but still have to maintain a staff to deal with us. When I rang them up to go through the process, they kept having to put me on hold to find someone who could clarify points, because it was so rare that they ever had to do this. To cut a very long story short, they put all the numbers into their computer, crunched it about a bit and announced that we couldn’t port the mortgage because their system said we couldn’t afford it. Now, I know things changed in the mortgage market in 2014, but we were on a combined income of about £50,000 when we moved up here and they were completely happy for us to borrow £145,000 interest only, with a monthly payment of £737 because our deal of base rate + 1.1% worked out at about 5.5% at the time. We’re now on a combined income of about £80,000 plus the estimated rental income (call it £20k after expenses) and they’ve told us that we definitely can’t afford the £115,000 outstanding – in fact, the most they’d be prepared to lend us if we ported the mortgage was…. It’s down to the credit cards, apparently. They did say that they’d be happy to lend us the full amount if we would let them take 80% of the value of Ethel’s as security as well, but obviously that doesn’t have a title yet, so nothing they could secure against. I’m now talking to the lender who’ll be doing the holiday let mortgage to see if their residential arm will take on our residential mortgage, as their commercial arm is happy with the credit card situation, but I fear that we may be stumped until Ethel’s is mortgageable. I just hope someone doesn’t come along and snap up the other house in the meantime. 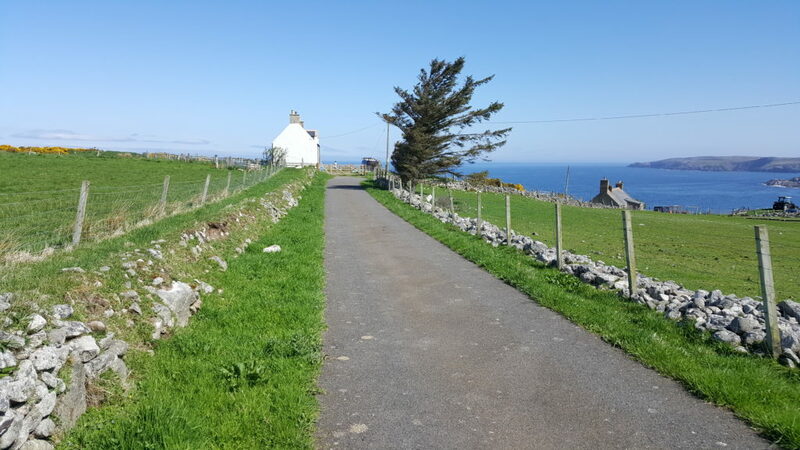 The bad news is that the mortgage company liked us but didn’t like the location of the house; they felt it was too remote to make a good holiday let! I asked our broker to point out that was kind of the point and he sent them a link to this recent Conde Nast Traveler review of the North Coast 500, saying it “may be the best road trip in the world”, but they decided it wasn’t for them. At this point, the broker said that if we really didn’t want to do it as a normal buy-to-let, he was out of options, so I spoke to a commercial holiday let specialist broker, who said that his fees on such a small mortgage would be uneconomic, but there was only one mortgage company he knew of which would do a loan of that size against a holiday let in Scotland and I should just ring them directly. Several phone calls later, they’ve indicated they’re willing to lend subject to us putting in a full application and getting written confirmation from a holiday letting agency that our house will make £9,600 a year in rentals net of agency commission. Several more phone calls and I’m waiting for the local area rep for one of the UK’s biggest companies (just under 20,000 holiday cottages on their books) to get in touch to arrange a no-obligation visit – I think it’s actually the perfect time for her to come and have a look, because I can ask her to assess Ethel’s house as well, and what she tells me will dictate, to some extent, how much money we invest in the furniture. I’ve also found a very helpful holiday letting forum, Lay My Hat, which is proving to be a fantastic resource for finding out about where to buy good-quality bed linen and towels without breaking the bank, what to provide in kitchens and so on. Meanwhile, down the road I’m still chipping away at the plastering and after a good 4.5 hour session today, the downstairs is pretty much done. Mick will sand it down tomorrow (this is his punishment for accidentally putting a tapered edge piece of plasterboard on an external corner, leaving me with an absolute crater to plaster over!) and then it’s just a case of filling in any little holes with a Go Outdoors loyalty card (nice and flexible!). 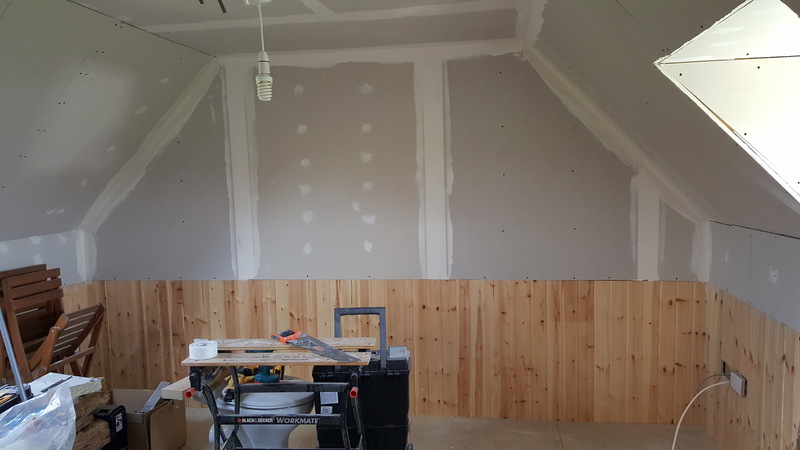 I’ve started plastering the small bedroom upstairs, but we need to get a few more sheets of plasterboard so Mick can finish off the gable ends in the other two bedrooms before I can do them. He’ll give Rembrand a ring next week and fingers crossed they’ll be coming west and can bring them out. Visitors who rent self-catering properties are thought to be worth almost £300m to the Scottish economy. An interesting article on the BBC website. The research only covers properties assessed for business rates as self-catering lets, not people doing Airbnb or renting out houses still assessed under council tax. 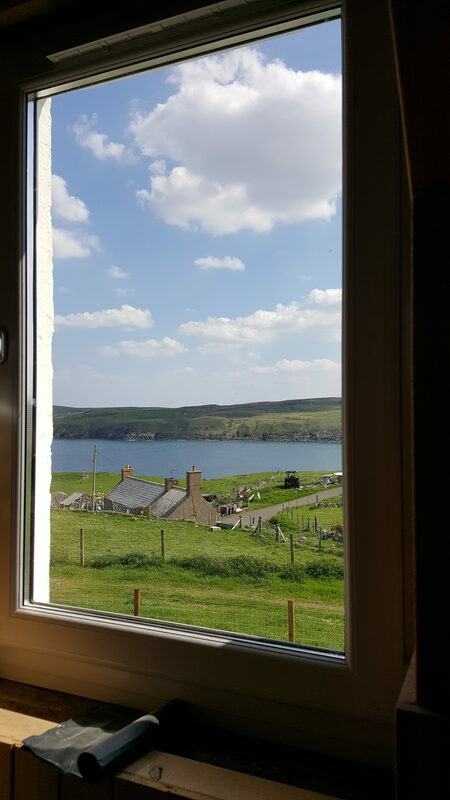 23% of visitors to Scotland rented a self-catering property for at least part of their visit. 32% came from England, with the north-west being the largest regional contributor and London the smallest. Scots renting self-catering properties in Scotland accounted for 30% of the total, while the other 27 EU nations represented only 4%. Most groups were made up only of adults, with children included in 30% of rentals. The average spend on accommodation was reckoned to be £643 per group, totalling £313m. They spent, on average, £245 on travel to and from the property. That’s not the only promising news today – we have passed the initial affordability checks for the mortgage we need and have now proceeded to a full application for a decision in principle. If we get that, then things are looking good – as long as they agree with the valuation. We’ve got a little bit of wiggle room cash-wise, but not a huge amount. I’ve also heard back regarding buying the land Ethel’s House sits on and the Agreement in Principle should be with me on Monday, but the gist is that I’ll need to pay them £150 for the actual land, plus £280+VAT to their solicitor for preparing and issuing the formal offer of sale, plus £300+VAT to the Drawing Office for them to send a surveyor up to prepare plans to be attached to the offer of sale. Then I’ll have my solicitor costs on top of that, so it’ll work out about six times the cost of the land for all the paperwork!! However, this gives the house title deeds and puts it on the Registers of Scotland, making it suitable security for a mortgage, so it’s well worth doing. The House Hoarder website uses affiliate links - all of them are tagged with an asterisk* after the link. Affiliate links means that sometimes if you click through to a website and register or purchase something, I get a commission from that sale at no extra cost to you. All opinions and reviews are my own.